How to successfully move your child to a big bed. By the time they reach three most children are ready to move from their cot into a bed. Your child may be too big for their now snug cot or may have already shown their readiness by climbing out of it. Other children, particularly those with older siblings, will have anticipated the change and begun to talk about having their own ‘big bed’. How to make the change without disturbing your child’s sleep? If your child is being moved out of their cot because you’re expecting another baby,make sure you prepare them for the change. 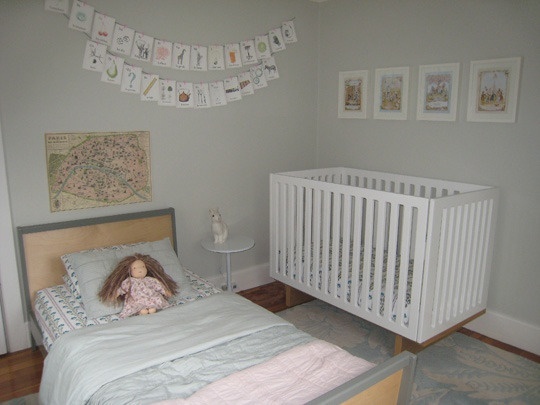 Take the cot down a few weeks before the baby is due and replace it with a bed in the same position, so that your older child is certain of what is happening, knows there is no going back and has time to adapt. Before you buy the bed, talk to your child about the change and involve them in decisions about the new bed. Where will it be? What bedclothes will they have? Where will you sit for a bedtime story? Focus the theme of the bed and bedding to reflect their favourite character or colour. Help to give your child a sense of occasion by putting special pictures on the wall by their bed and talk to them about their new bed; mention friends of theirs who have made the shift to a big bed. Use books and magazines to show them pictures of big children in nice beds and small babies in cots. When your child first moves into a bed it is not unusual for them to fall out. There are a number of precautions to take to keep your little ones safe. Choose a bed that is low to the ground and has a safety guard. Make sure you childproof the bedroom with safety catches on windows and doors and secure furniture to the walls. Clear toys and objects away at bedtime; especially things that could be used for climbing, such as a toy box or stool. Consider putting up a stair gate across the bedroom door the day you introduce the bed, to stop night time wandering. Have a warm relaxing bath lasting no longer than 10 minutes. A bath before bed should not be a play time as this could over stimulate your tried child, waking them up again. Go straight from the bathroom into the bedroom- do not go back into the living area as you will lose focus of the routine. Dim the lights in the bedroom ready for your return from the bath – this will help with the production of the sleep hormone melatonin. Read 1 or 2 stories, have a cuddle and kiss goodnight and tuck them in with their favourite soft toy so they are warm and cosy. Then leave the bedroom with them drowsy, so they learn to fall asleep independently.Your child should be asleep about 15 minutes later. If having done all of these things you are having problems with your child’s sleep please get in touch. You can speak to one of our sleep therapists today for a free sleep assessment.